Braskem, the leader in Latin America’s chemical industry, has, since its foundation, been committed to operating in accordance with sustainable development principles. As a signatory to the UN Global Compact since 2007, Braskem has participated actively in the construction of the Sustainable Development Goals, which dialogue with respect to human rights. The Company considers internationally recognized human rights the foundation of sustainable development and upholds them in its business activities, including in joint ventures and the value chain. This commitment is aligned with the UN Guiding Principles on Business and Human Rights. It is also present in its codes of conduct and global policies , approved by the Board of Directors or the Board of Executive Officers. These outline the behavior expected and the responsibilities of its employees and business partners in order to continuously and proactively identify, prevent and mitigate exposure to the risks of violation of human rights, as well as to remedy the current impacts of its operations, products, services or commercial relations. Click here to learn about the compliance status and evolution of our voluntary commitment to the Ten Principles of the UN Global Compact. Human rights are basic rights inherent to all human beings, regardless of gender identity, sexual orientation, race, nationality, social class, religion, physical characteristics or any other condition. These include the right to life and freedom, freedom of opinion and expression, the right to work and education, the right to well-being, among many others. In fact, these are not merely social in nature, but also civil, politics, economic, cultural and even environmental issues. Analysis of petrochemical companies are working on Human Rights. Identification of risks and violation of human rights in operations, products or services of Braskem and its chain, as well as holders of these rights. Analysis of how Braskem identifies, prevents and mitigates risks of itself and of its chain. Review of over 100 documents: Among these, Braskem evaluated the 2016 Image and Reputation Survey, which had 5,190 online responses from Team Members, Clients, Suppliers, Scholars, NGOs, Local Communities, Trade Associations, Government, Media and the General Public. Analysis of how Braskem’s current policies and processes enable it to effectively protect and promote human rights, as well as final recommendations. 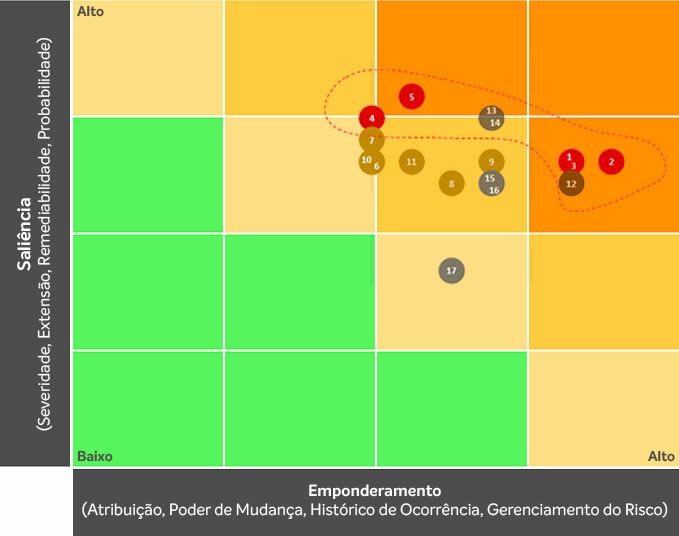 Analysis made by third party (BSR/Rever Consulting). As a result, Braskem identified all risks of violation of human rights in its operations, products or services and the main risks in its chain, as well as holders of these rights. 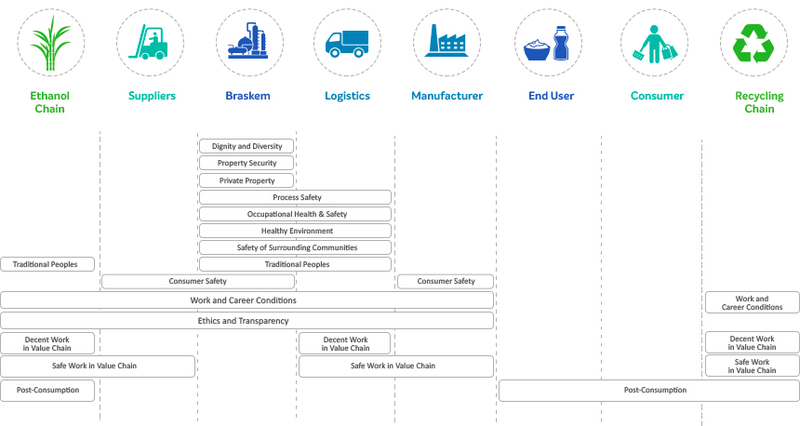 The following image shows the value chain where each of these risks may occur under Braskem’s priority attention viewpoint. Note that those related to safety, health and environment (including post-consumption) are common to any industry. Among the holders of human rights that may be affected are team members and contractors who work at Braskem's facilities, workers in the value chain (particularly those working in small businesses and rural areas, third- or fourth-party truck drivers and collectors), consumers and local communities (including traditional peoples, such as indigenous people, fishermen and quilombola communities). Moreover, since it evaluated its practices regarding protection and promotion of Human Rights in its operations and its chain, the company had sufficient inputs to prepare and approve its first Human Rights Violation Risk Matrix in 2017. The targets of Braskem’s Sustainable Development macro goals contribute to Human Rights and, hence, were correlated to the risks. Learn about Braskem’s macro goals here . The matrix defined Braskem’s operational priority by identifying five potential risks (called focus 1 risks), ensuring the preparation of effective action plans that are capable of re-signifying three of them to be controlled in a year and a half. Note that some of the high risks have excellent consolidated management and, hence, there is no risk of their possibly happening. To ensure integrated risk management, Braskem included the risks of violation of human rights in Corporate Risks Matrix, which is monitored by the Board of Directors and by Senior Management. Action plans were prepared for each country, covering the four countries where Braskem has industrial operations, in order to reduce the probability or impact associated with the risks. Evaluation will also be reinforced in the process of reviewing Braskem's Materiality Matrix, which evaluates the relevance of sustainability topics based on a survey among stakeholders to devise the company's strategy to contribute to sustainable development. This ensures a periodic and systematic review of risks and opportunities in human rights, and a more humanized decision-making process. Braskem takes action to promptly treat any allegation of misconduct, contrary to the Codes, our Values or the Law. In this regard, the Ethics Line channel is made available by Braskem so that its Employees, Suppliers, Third Parties, Customers and other member of the public can, in a safe and responsible manner, contribute information to maintain a safe, ethical, transparent and productive corporate environment. The Ethics Line channel is available 24 hours / 7 days a week on the external portal ( www.ethicslinebraskem.com ), on the inner portal and through toll-free phone numbers (attended by third party specialized professionals in complaint handling, except Germany) in the language of the countries where Braskem operates. All allegations received through the Ethics Line channel are registered and investigated with independence, impartiality, methodology and legal protection, guaranteeing confidentiality, anonymity and prohibition of retaliation against the complainant, even if the facts of the situation are not entirely clear. All allegations and the results of investigations are periodically reported to the Global Ethics Committee which, in turn, reports to the Board of Directors via the Chief Compliance Officer. See the main 2016 results of the Ethics Line channel (including remediation measures) on page 33 of the Annual Report. In accordance with our commitment to transparency, Braskem also disclosed details about mismanagement on pages 31 and 32. Moreover, Braskem has communication channels open to all Communities where it operates. In some units, in addition to the 0800 emergency hot-line and the contact area available on the Company’s website, the Community may interact with the Company through periodic meetings, factory visitation programs, training, and interface with the government – initiatives usually promoted by the Community Consultative Councils (CCC’s) of each location. Braskem Code of Conduct : It establishes the rules of conduct that will guide internal and external professional relations of the company’s team members, making them aware that any breach, whether through action, omission or complacency, may result in violations of law, losses for society and damages to the image and reputation of Braskem. It also describes Braskem’s commitment to operating with ethics, integrity and transparency, its commitment to sustainable development and its recognition of the human rights of all, as described in the Universal Declaration of Human Rights and the UN Guiding Principles on Business and Human Rights. Code of Conduct for Contractors : It provides, in a clear manner, the values and behavior expected from each Contractor. One example is that each contractor must support and operate in compliance with applicable local laws and international commitments, treaties, conventions, standards and norms, such as the Universal Declaration of Human Rights and the UN Guiding Principles on Business and Human Rights, in order to pursue a sustainable operation guided by ethics, integrity and transparency. “Contractors” are any natural person or legal entity that acts on behalf of, in the interest of or for the benefit of Braskem, and supplies goods, materials, services or information, including, but not limited to, any distributors, agents, brokers, forwarding agents, intermediaries, suppliers of supplies, consultants, resellers, representatives, joint venture partners and others. Global Sustainable Development Policy : It integrates and clarifies the corporate rules and guidelines on the topic, more specifically human rights, relations with communities, as well as environmental protection and preservation. It also defines the responsibility of each Senior Management Leader to ensure its compliance, based on a continuous process of: identifying and evaluating the aspects and impacts generated by businesses, products or services (considering the entire value chain), integrity and action, of monitoring, communication and reporting. Global Anti-Corruption Policy : It addresses the Company’s position on combating corruption, reinforcing to its Team Members and Contractors about Braskem’s zero tolerance for acts of corruption and also describes the diverse types of corruption, including, but not limited to, bribery of government officials and facilitation payments. Health, Safety and Environment Policy: It establishes Braskem’s and its team members’ commitment to Health, Safety, Environment, Quality and Productivity and provides guidance to stakeholders. This Policy applies to Braskem globally and must be observed by all Small Businesses, Business Units and Business Support Areas. Suppliers and partners must also be aligned with Braskem’s health, safety, environment, quality, efficiency and productivity values. The company also has internal guidelines and procedures to address Risk Management, Internal controls, Internal Audit, Conflicts of Interests, Evaluation and Approval of Contractors, Disciplinary Measures, offer and receipt of business gifts and other relevant issues concerning ethics, integrity, transparency and sustainability.